Last week we talked about working some inspiration into our grilling. With all the incredible local produce available, it's fun to get creative out on the back deck. Using Emeril Lagasse's very useful cookbook "Emeril at the Grill" as a guide, we also tapped into the wealth of knowledge that Chef Jerry Pellegrino of Waterfront Kitchen brings to the table. As we said last week, our fabulous locally grown produce offers nearly infinite possibilities. So, we are marrying up a featured protein with a dynamite sauce or a killer summer salad. It goes without saying that we are in the middle of grilling season, and our local markets are bursting with fresh, local produce. Our natural inclination is to blend the two together, but we sometimes need a little inspiration. And between Chef Jerry Pellegrino of Waterfront Kitchen, and Emeril, we have a lot of inspiration. I've has become a big fan of taking vacations in Normandy, France. There is something about the gentle Norman countryside that really appeals to me, and believe me you do eat well over there. And one of the most popular items in Normandy threw Jerry a curve ball the first time I ever mentioned it, and that is the galette. Our national celebration has just past, so it's a good time to consider the great heritage America's farms have bestowed upon us. During this season of tomatoes, corn and watermelons, it's easy to overlook a pair of bit players in the summer, and that would be radishes and carrots. But we've now started to see some heirloom varieties of these garden greats. Summer is a time for some pretty serious salad making and some pretty serious grilling. Most salads need a little zing, and the various members of the onion family were put on earth to do just that. And we shouldn't be surprised that a lot of these oniony veggies can serve multiple roles. Chef Jerry Pelligrino of The Waterfront Kitchen filled us in on some of the things we should look out for. In case you might not have noticed, Baltimore is developing quite a reputation as a town with some mighty good chefs. And to prove the point a number of books have appeared lately featuring our talented cooks. And we are very proud to see that you have made it into one of the newest books featuring the local team. Summer is the time to travel and whether you travel within the state, hit the wide open highways of America or fly abroad, you're going to want to eat. Of course, dining out is a big part of the fun of travel, but you might want to do a little home cooking too. We've tipped into summer and the farms of Maryland are sending all sort of fabulous food to the markets. One of the more dramatic vegetables you'll find out there this time of year is rhubarb. The long, bright crimson stalks of rhubarb look incredible, but the problem always is: what do you do with them? And there's more to rhubarb than good old rhubarb-strawberry pie. Like a lot of folks of a certain age, I grew up watching Popeye the Sailorman and loving every minute of it. But something baffled me: the spinach thing. If they were talking about the reeking, droopy, plop of who-knows-what that they served in school, it didn't make any sense. My parents told me Popeye was the creation of the powerful spinach industry, but that may not have been true. Research reveals that Popeye was not created to sell spinach, but the cartoon's creators remembered their mothers saying, "Eat your spinach, it will make you strong!" So it became Popeye's magic elixir. We're going to be in salad season for quite some time now. Two weeks ago we talked about the wide variety of greens that are grown here in Maryland. For the next few months they're going to be available in abundance. And we could spend a whole show talking about one of the most important components of a salad, and that would be vinegar. One of the biggest cravings I have every spring is for fresh, local fruit. Last year's apples are still available, that's true. But I'm thinking of something a lot fresher and a lot juicier. And it's just our luck that nature arranged for two succulent berries to be available this time of year: strawberries and blueberries. One of the mainstays of the spring marketplace are salad greens. These crisp, refreshing components of endless salad variations are among the first local items to arrive every year. And when we start talking about building salads we should also talk about salad dressings, and in particular vinaigrette. I think in some ways this spring of 2014 is all the more welcome because of the severity of our winter. For the last few weeks we've been enjoying wonderful weather, warm breezes and the miracle of our gardens coming back to life. And as Chef Jerry Pellegrino of Waterfront Kitchen has observed, this long-awaited season of renewal ought to be celebrated somehow. Since the farmers' markets reopened this spring, one of the easiest things to find has been fresh herbs. Now, herbs are great because they can be grown under cover, and a little bit of space can yield a lot of product. There are a lot of herbs out there to work with, but we don't always have an idea about what to do with them. We also don't always have an idea how to preserve them for later use. One of the frustrations of seasonal eating is that we can't always eat as much as we can buy; so the problem is, how can we save it to enjoy it later? Salting and brining are two ancient techniques of preserving food, but sometimes the flavor changes are so significant that we might do it for the sake of the taste. 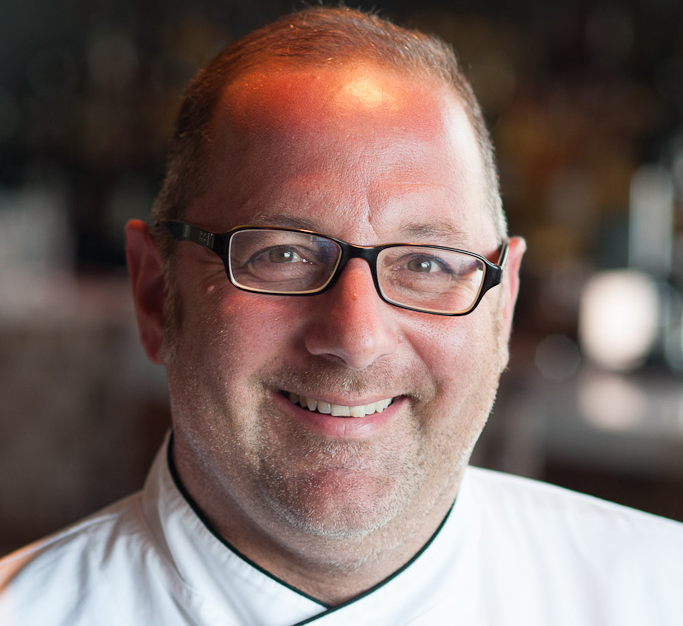 Chef Jerry Pelligrino of Waterfront Kitchen has thought a lot about this. Spring is all about freshness, and the greens and salad fixings we are now seeing in the market are the epitome of that concept. Salad making is to food what jazz is to music... it's all about inspiration, improvisation and going with the flow. And so we thought it would be fun to hear a chef riff on this theme, and we invited Chef Ontaria Kirby of Clementine on the show. When we dine out these days, there's something happening on the plate at good restaurants everywhere that might be easy to miss. More and more chefs, and home cooks for that matter, are using something called "micro-greens" as ingredients and garnish. Easily mistaken for alfalfa sprouts, micro-greens are created during the infancy of an edible plant. They usually have a wispy little stem and several small but flavor-packed leaves. They are very easy to grow, requiring minimal space, and they come in a wide variety. I'm unusually skeptical about the weather this year, and I wish I could feel more confident that spring truly has arrived. In many ways this is like the beginning of a new year for us, with all of the springtime produce now in the pipeline. And one thing I can't get off my mind are those lovely little tender white potatoes that we get this time of year. All right, the calendar page has turned. It is officially April and it is well past the turn of the seasons, so let's have us some Spring! The era of root vegetables, God bless 'em, is behind us, and the era of Primavera is at hand. And as Chef Jerry Pellegrino of Waterfront Kitchen knows, cuisines all over the world know how to celebrate the coming of Spring. Last week we talked about dishes from Spain that I hoped I would encounter when I go there next October. This week we're going to cover some of the favorite foods of its neighbor, Portugal. If you go online and peruse any Porutguese restaurant menu, you will find numerous references to octopus and squid. And those of you who are veterans of spring break in Florida will remember another creature of the deep: conch. Here is Jerry's favorite recipe for octopus, plus two other great recipes. A little later this year I'm going to be going to Spain and Portugal, and in anticipation I've been looking up some recipes in my big book of Spanish cooking. And as Chef Jerry Pellegrino of the Waterfront Kitchen knows, there's a lot to like about Spanish cooking. The question these days, of course, is will winter ever go away? Right now a lot of us are suffering late winter blues, and we desperately need a cure. Which is exactly why we invited our friend Chris Corbett to join us. He came by to buck us up with talk of chowder. Chris is a native of Maine, and he carries his heritage with him wherever he goes. During the winter months he loves to whip up a steaming bowl of New England style chowder (chow-dah, as he says) to keep body and soul together. Our topic this week may be something of a turn-off to some people, and something of interest to others. Here's the deal: every now and then, maybe once every two years, I get a hankering for a raw beef sandwich. It's a taste I inherited directly from my father, so I think it's in my genes. And Chef Jerry Pellegrino of the Waterfront Kitchen tells me that every time he puts Beef Tartare on the menu, it sells out. As winter keeps its icy grip on us, more and more often we seek comfort from our family dinners. Everyone has a short list of favorite dishes that warm the soul as well as the belly. I love a simple dish my father taught me, cabbage and noodles, and my mother's old standby, tuna noodle casserole. In fact the All-American casserole is classic comfort food, and Chef Jerry Pellegrino of the Waterfront Kitchen uncovered a few delicious recipes. As we suffer through some very nasty weather this winter, it's good to stop and think about the Watermen of the Chesapeake Bay who are going out day after frigid day to harvest their oysters. We're in the heart of oyster season right now, and it's a good time to talk about a few of the things you can do with our splendid bivalves.